Hungry Hungry Highness: Happy Pi Day! Pi Day, March 14th, is one of the best days of the year. First of all, it's my best friend Kaki's birthday. 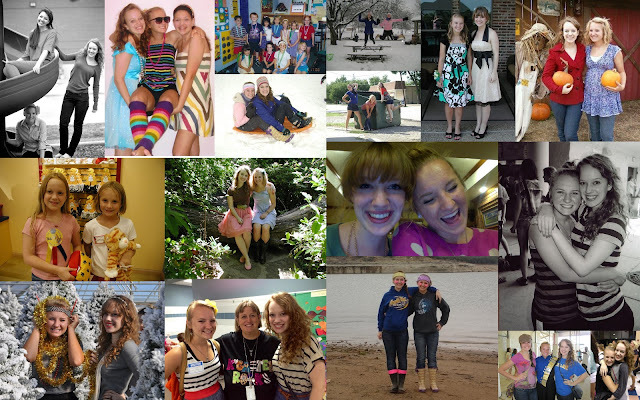 We've been best friends since kindergarten and I'm so blessed to have her in my life! Second of all, pie is the superior dessert. 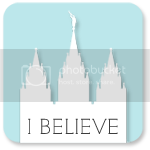 If you don't believe me, click here. Apple pie and pumpkin pie are my favorite types of pies. Today I decided on apple pie because it's March and however much I may want pumpkin pie all year round, I think it makes it better to have it only in the fall. It makes it more special, you know? So I went with apple! This recipe is just a family recipe my mom passed on to me. We change the ratio or apples & sugar every time, but this is what I went with this time. I used my absolute favorite pie crust recipe, brought to us by America's favorite baker, Martha Stewart. The trick is the ice-cold water. It's totally worth making, y'all! Don't buy an icky pre-made pie crust. 1. In a large bowl, whisk together flour, sugar, and salt. 2. Using a pastry cutter, cut in the butter until the mixture resembles crumbs. This is a pastry cutter. 3. Slowly add the water while cutting until it's incorporated and flaky but sticks together. 4. Form into a ball with your hands and flatten slightly so it's a disk shape. Wrap in plastic wrap and refrigerate for at least an hour, up to 1 day. You can freeze it for up to a month, as long as you thaw it for 24 hours in the fridge before using. 5. Roll it out and transfer to a pie pan. Cut the extra on the edges of the pie pan. "Fork" the crust. Preheat oven to 425 F. Refrigerate pie crust for 15 minutes while the oven is heating. 6. If desired, place foil in the bottom of the pie crust and add dried beans as pie weights. Bake for 15 minutes, making sure to puncture the crust with a fork if it gets puffy while it's baking. These are old pictures from when I made another pie. 1. Peel, core, and slice apples into small (1/4 inch) slices. Put them into a large pot. Add all the ingredients on top and stir until the apples are coated with all the ingredients. I've finally perfected the art of peeling apples in one peel! 2. Cook at low-medium heat for about 8-10 minutes, or until the apples are slightly softened. 3. Pour all the warm apples into the pre-baked bottom pie crust. 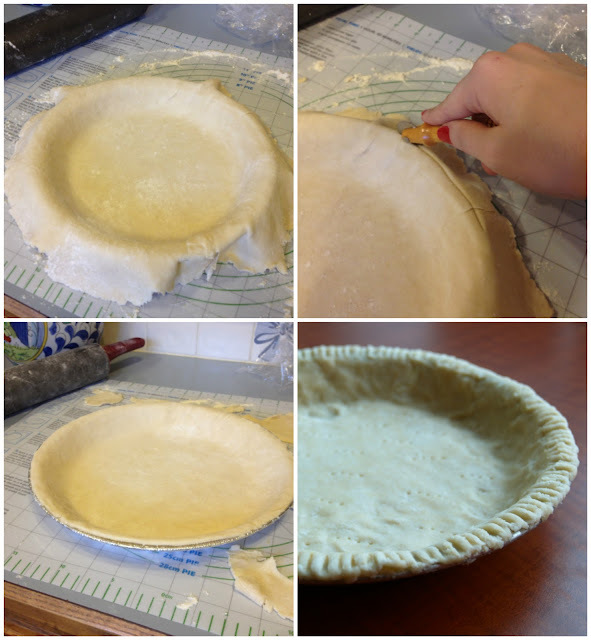 Roll out the top pie crust and make whatever pattern on the pie crust you like. Brush the top with an egg wash of egg and half and half. 4. Bake at 350 for 30 minutes or until the top crust is lightly golden. 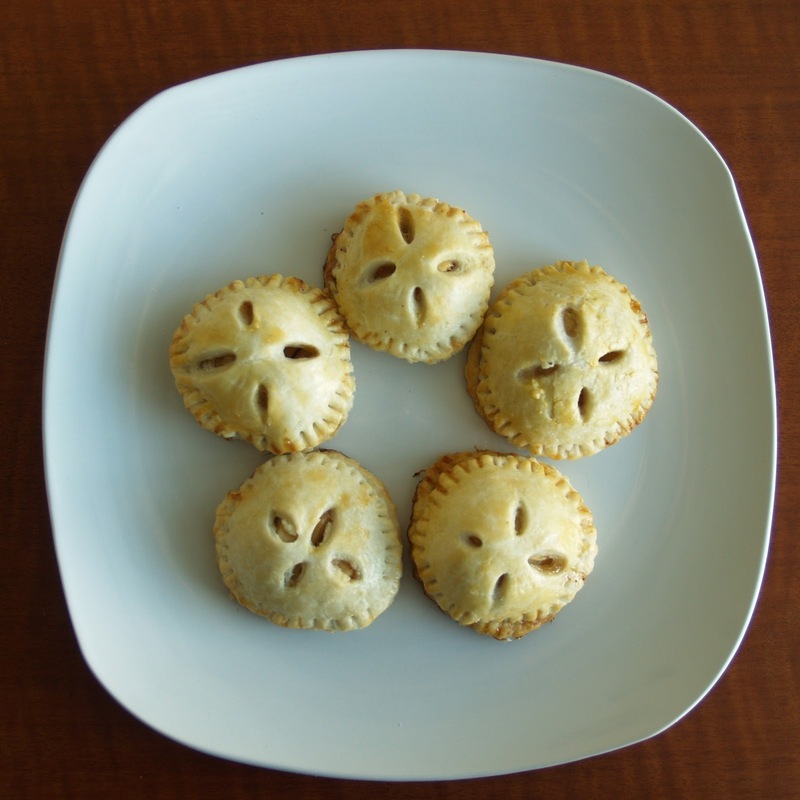 With my leftover pie crust dough, I made some mini apple pies. You could really do this with any fruit. Look how cute they are! I filled them with the apples I cooked for the apple pie, brushed them with a little egg wash, and baked them on my silpat for 20 minutes. Go out and have some irrational fun!